As I mentioned, Fort Ethan Allen turned out to be an ideal place to locate studios for stations transmitting from Mount Mansfield. 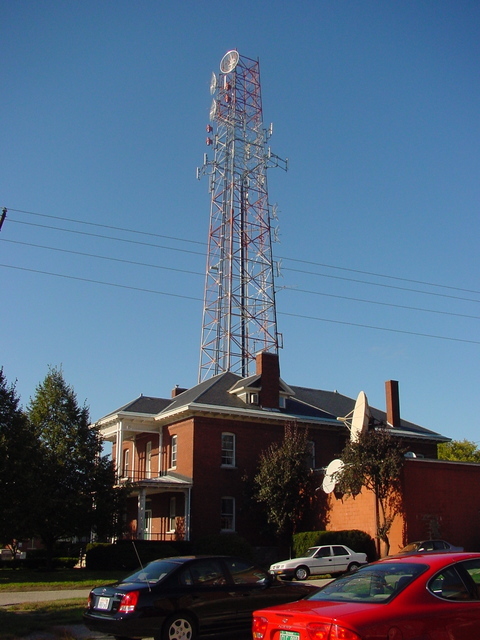 When I first saw this building, at 1500 Hegeman Ave., it was the home to just one station: Knight Quality Stations' easy listening WEZF (92.9 Burlington), with a grandfathered class-C signal from the top of Mt. Mansfield covering all of northern Vermont and putting a solid signal even into the office canyons of downtown Montreal. WEZF is still there, but having passed through a succession of owners since the Knight family left the ownership ranks, the station has now ended up in the hands of Clear Channel. Unsurprisingly, the sizable CCU cluster in Burlington is now being operated out of this same small studio building. In addition to WEZF, the CCU Burlington family also includes sports-talk WEAV (960 Plattsburgh, N.Y.) and WXZO (96.7 Vergennes), new-age WJVT (92.1 Port Henry, N.Y.), and classic rock WCPV (101.3 Essex, N.Y.).